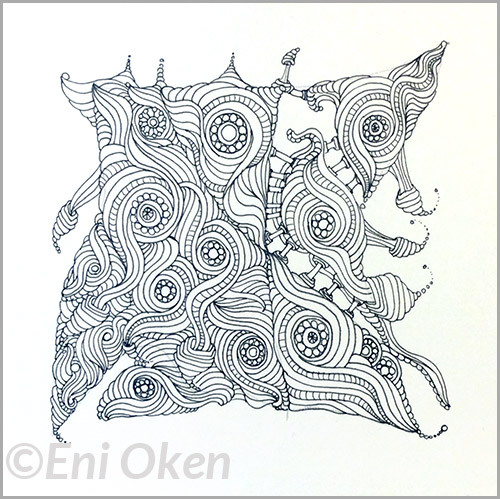 Verve is the focus tangle pattern for this week's Shading Challenge. I just LOVE this tangle pattern!!!! 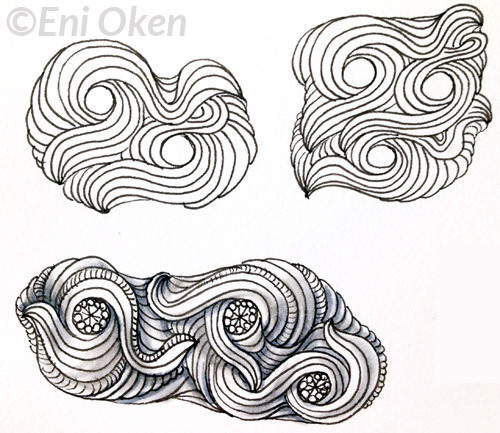 These are some of the sketches I created when first trying to understand the pattern. Instead of creating one single circle, I created clusters with three or more center circles, and let the ribbons fall where they may, over, under, behind. Drawing the tile was super FUN, it went into the most twisted and weird convolutions. It gave me plenty of opportunity to explore this new "tangle accessory" or "tangle terminal" (Thanks again Antonine! ), the one that looks a bit squarish. This is an EXTRAORDINARILY difficult tangle to shade. It's crevices and organic nature make it impossible to know exactly where to shade darker, and you really have to use a great deal of intuition. I started by darkening some of the obvious crevices and corners, and then hoped the whole thing would come together. Ink and graphite pencil over paper. I'm happy with the results, but it gave me a headache to figure out the shading. I don't know that I would include it in the list of my most loved tangles, but I certainly had a ton of fun drawing it! Serves to show! Last weeks tangle W2 started as a dreaded pattern and now is one of my favorites; this one started as a love affair and ended up soon. That's why from now on, my new motto is: try any new tangle even if I don't like the look at first glance. You never know when you're going to fall in love again.